What is the importance of words? How does the effective choice of one word matter? Warwick Fox, Toward a Transpersonal Ecology, (Albany, SUNY Press, 1994). "A note on terminology is warranted at this point.... First, the term environment refers to the external conditions or surroundings of organisms, whereas ecology refers to the relationships between organisms and their external conditions or surroundings, that is, their environment. The prefix eco- ( stands for ecology) is therefore more appropriate for my purposes than the adjective environmental because the kind of approach I will be developing herein is one that attempts to break down the rigid distinctions that we tend to draw between ourselves and the environment.... this approach attempts to foster a greater awareness of the intimate and manifold relationships that exist between what we conventionally designate as self and what we conventionally designate as environment. It attempts,... to foster the development of an ecological rather than environmental consciousness." The photograph of these thatchers from the Netherlands reveals the use of marsh cordgrass wetlands for the reeds they produce that these workers use to cover the roof of the building. The thatch roof protects inhabitants from the external conditions of wind, rain, sun and snow. Such dwellings reinforce our notions that the inside and the outside are different conditions of existence. Instead they may be two sides of the same coin. That coin by analogy is the ecological milieu. The milieu is more than surroundings. It is the entire table of ingredients within , around and through us that ties life to its surroundings and binds all living things together. 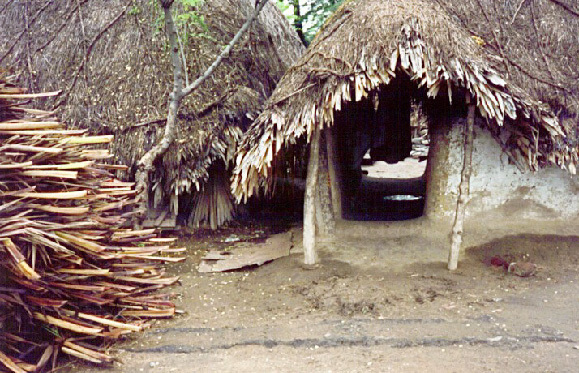 The natural materials used for a home in India is an example of an environmental influence on cultural habits and social behavior. Consider what is worth preserving? Why word-use and choice of words matter. How one may determine the differences in meaning among: environment, ecology, nurture & nature. By analogy to our perception of a three dimensional world, the metaphorical use of dimensions to describe ecological thinking considers how populations of living things can best be understood as intersecting planes of a three dimensional figure. One plane is biological and the other is demographic (study of populations). 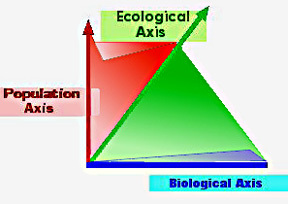 Ecological thinking combines these two other dimensions; one is the dimension of life, the other is the area and resources needed for life. This functional niche refers to what populations or species takes from and gives up to an ecological system. All individuals can be thought of as members of a changing population. By combining population thinking with the field of biology [population biology], ecological thinking adds depth or volume to natural history or natural philosophy –the two branches of thought used since Aristotle to describe nature. What does the author think is the main difference between environment and ecology? Why is it, in his opinion, important to make this distinction? What examples can you give from the readings where such a distinction was made? What examples can you give from the readings where such a distinction was not made?